The Deluxe Original Box Shelf is designed to be the strongest shelf available. Upright Posts are available in three different designs: angle, beaded, and high rise box post. All are roll formed of heavy gauge steel. There’s no problem too large for Deluxe. Deluxe Shelf Accessories keep your materials organized and in the right place, eliminating the worry of boxes dropping off the back of the shelf, or not being able to quickly find product needed. Stiffening offset rib–ideal for seismic applications. Always used as rear posts in combination with other posts. Double-sided design with independent shelf positioning–deal as common posts between multiple units. Maximum weight-bearing capacity for heavy-duty and multi-level applications. 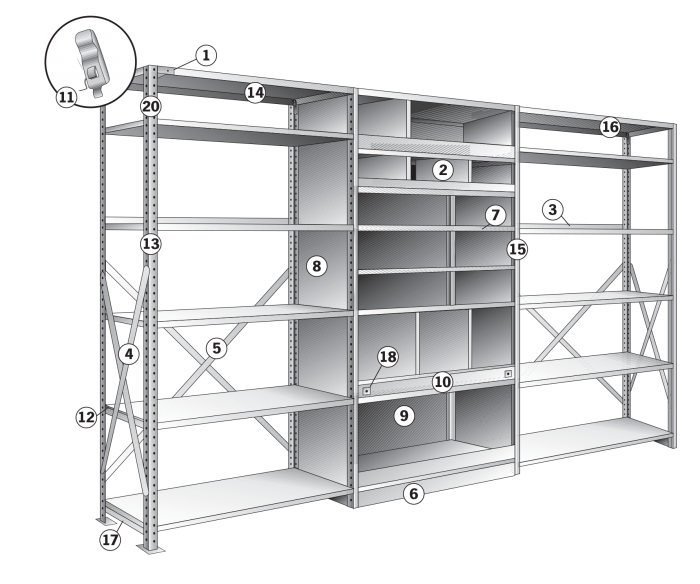 Shelf slips in and out without tilting, facilitating fast installation and rearrangement. Double-sided design with independent shelf positioning–ideal for common posts between multiple units. Perfect for heavy applications like record storage, seismic applications, and multi-level systems. Save space and material on multi-level systems by using the High Rise Box Post on the first level, and splicing a beaded post above. Roll-formed, spot welded box beam construction with lapped and welded corners. Side edges are return-flange construction. Punched to accommodate shelf dividers and label holders. Shelf clips included with medium duty, standard duty, high capacity, and heavy duty shelves. Extra heavy duty shelves use reinforcing channel (field installed) and attach to upright posts using side shelf supports instead of shelf clips. 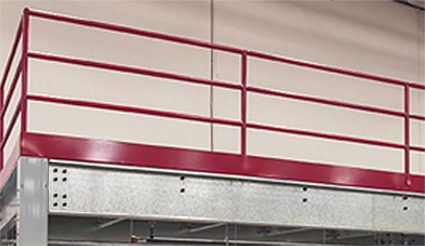 Engineered to meet or exceed all OSHA, UBC, and seismic requirements, catwalk systems make use of wasted overhead space, while minimizing utility costs. Engineered calculations and stamped drawings for permit applications are available. Flooring options require corrugated roof-decking (B-deck) underneath because the B-deck provides the load-carrying capabilities. 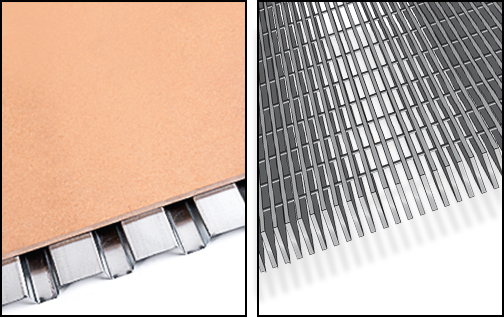 Diamond Plate (not shown)–to add more resilience in pallet drop areas, diamond plate can be used on top of the engineered wood product. IBC is being adopted by most building departments throughout the country. With top of deck greater than 12’, a stair-case must have a mid-landing. Nominal rise is 7” and the run is 11”. Treads are formed-steel diamond plate. 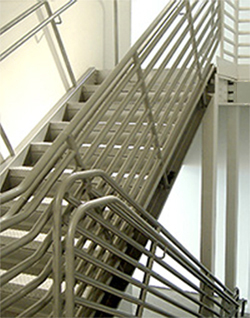 Stair stringer made of formed high-strength steel c-channel. Stairs over 12’ tall require an intermediate landing.